Mt. Everest view from Tengboche. 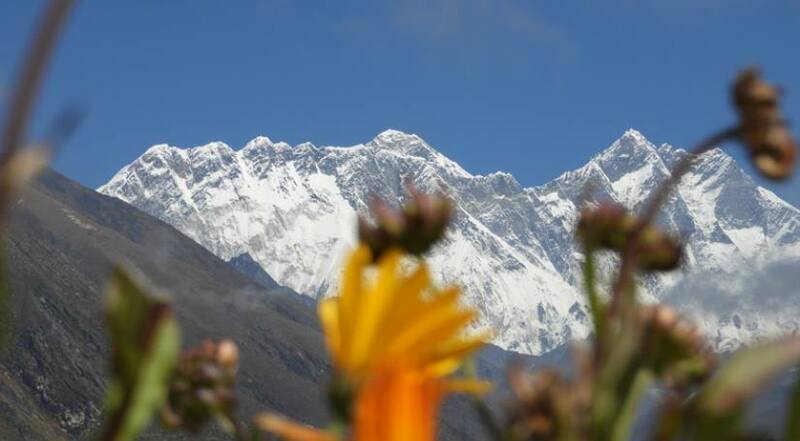 Everest View Trek is an easy trekking route in the Everest region. It can be an alternative to the Everest Base Camp Trek. If you are time bounded and you still want to see magnificent Himalayan views in the Everest region, you must go for this 10 days Himalayan trek. The Everest View Trek is more than witnessing the Everest panorama. The trek is popular for its pristine landscapes and diverse wildlife. The feeling of trekking through the heart of beautiful Sherpa Villages with their own unique cultures and traditions is phenomenal. These 10 days trek to see Everest will give you an ideal experience of stunning peaks and lifestyles in the Himalayas. You will see many renowned mountains in the Khumbu region. Mount Everest (8848 m), Lhotse (8516 m), Nuptse (7855 m), Pumori (7161 m), Changaste (7550 m), Mount Amadablam (6856 m), Mount Thamserku (6723 m), Mount Kantega (6979 m), are few. Walking around the cold and wild mountains, the Everest region trek route takes you Sagarmatha National Park, a UNESCO world heritage site. The site is famous for its unique flora and faunal diversities. Himalayan monal, blood pheasant, yellow and red-billed chough, snow leopard, Himalayan black bear, musk deer, red panda, etc are few. This region is rich in Buddhist Culture. You will see the prayer flags, chortens, and Gompas all over the trekking route. There are various ancient Buddhist monasteries. These monasteries help you uplift your spiritual understandings. 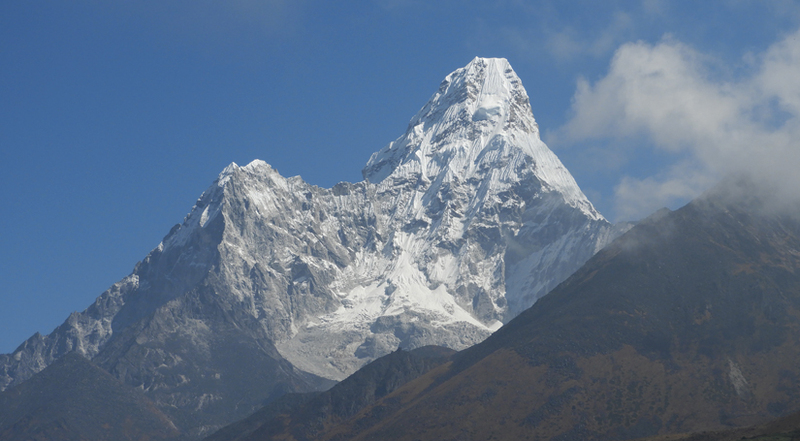 Everest View trekking is not so difficult trekking as compared to other treks in the Everest Region. This 10 day Everest trek is a fusion of natural and cultural and spiritual beauty. This trek is possible throughout the year, but the best time is from March to May and from September to November. 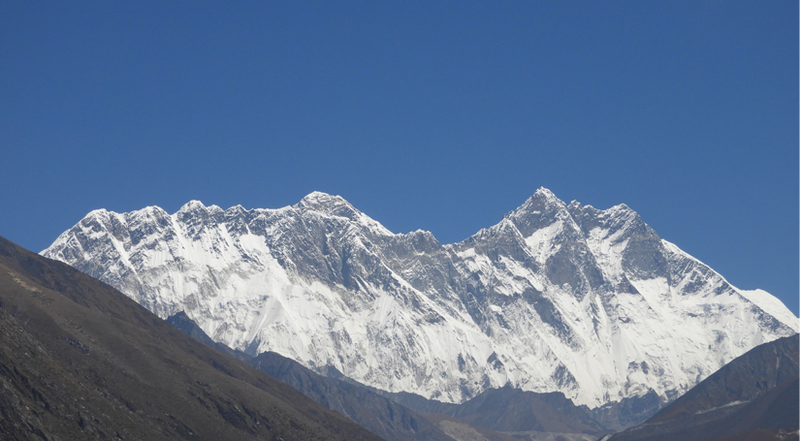 If you wish to explore the enchanting Himalayan ranges, Everest View Trek is a great option. Be determined, and the trek will take you to the stunning views of the Everest range. And, with our experienced guide of Himalayan Joy Adventure, your trip is sure to be splendid. Spring (March to May) and autumn (September to November) are the best months for Everest View Trek. During the best months, the sky is generally crystal clear. The atmosphere is lovely with breathtaking panoramic views of mountains. The weather is favorable as well. Spring (March to April) is the months of the blossoming season of many other flowers including Rhododendron. From October to December you will see greenery of lush forests. Everest View Trekking is possible throughout the year. But, the number of trekkers is very high per day during the best seasons. Everest View Trek is an easy trekking route as compared to the other famous trekking routes in the Everest Region. However, in terms of altitude and difficulty, it is a mid-level trek. Thus, anyone who is physically fit and mentally determined can easily do the trek. The beautiful and adventurous flight to Lukla airport. Opportunities to witness the unique and lively culture of Sherpa people of high Himalayas. The Namche village, a beautiful Sherpa village of Khumbu region. 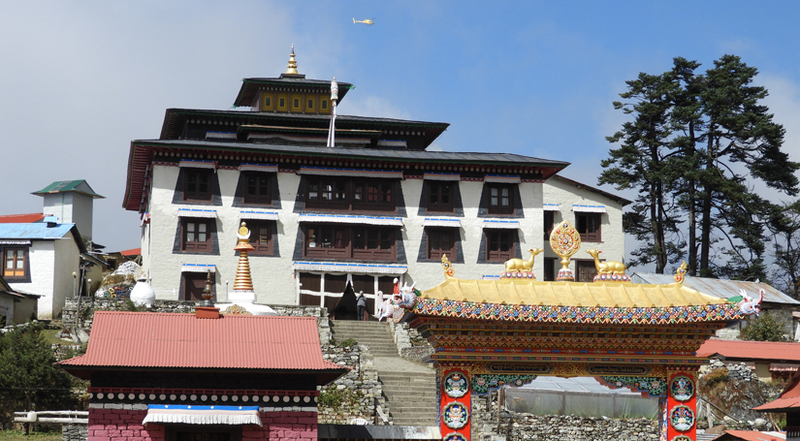 Age old Buddhist monasteries in places like Namche Bazaar, Khumjung and Thame. Panoramic mountain views of various snow-capped Himalayan peaks like Thamserku, Kangtega, Lobuche, Cholatse, Pumori, Nuptse, Lhotse etc. including the majestic Everest itself. Trekking to the highest point of the earth. Beautiful valleys, extraordinary views of thundering rivers, hikes over suspension bridges, beautiful evergreen pine forests, diverse Flora and Fauna. Forests blossoming with Rhododendron flowers in spring. The short trek of the Everest region. Our (Himalayan Joy Adventures) representative will meet you at the Tribhuvan International Airport upon your arrival. We will drop you to your hotel from the Airport. After checking into room and freshening up, your guide will describe the details about your trek. In the evening, Himalayan Joy Adventure will host a welcome dinner at the typical Nepali restaurant with a Nepali cultural dance. After dinner, we will drop you at your hotel. Overnight in hotel. Day two involves sightseeing of UNESCO World Heritage Sites in the Kathmandu Valley. Some of them are Kathmandu Durbar Square, Bhaktapur Durbar Square, Pashupatinath Temple, and Boudhanath Stupa, Swayambhunath temple, and Patan Durbar Square. Enjoy the thrilling 30 minutes flight from Kathmandu to Lukla. The short and beautiful flight to Lukla airport is refreshing. On reaching Lukla, we follow the trails of Everest View Trek to Phakding via Chaurikharka and Chilung. Overnight at Phakding. Overnight stay at available hotels/ lodges. After a nice breakfast early in the morning, we will start our trek. 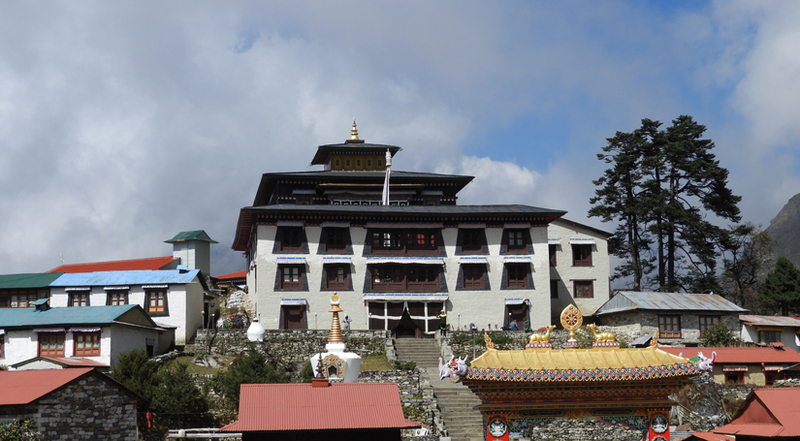 We will trek an uphill trail up to the Namche Bazaar(3435m), a Sherpa capital. The hike is for about six hours. From Namche, you can see the first glance of Mt. Everest. Overnight at a hotel in Namche. 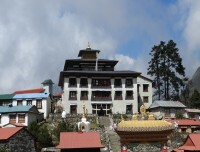 You will have plenty of options for accommodation as there are enough hotels at Namche. There will be drastic changes in environmental conditions like altitude, climate, etc as you step in the Himalayan region. So, this day is about adjusting to the new environmental conditions. Explore the Namche Bazar. Enjoy the beautiful views around. On your acclimatization, you will walk to the Everest View Hotel and enjoy a Nepali lunch with the warm hospitality of Sherpas. As we leave Namche, we head further into the mountains. The trails are narrower and less “paved”. This is one of the toughest days of the trek. The Tengboche monastery is a major attraction. It is an old Buddhist monastery and a place of spiritual beauty as well. From Tengboche, we descend the mountainous trails back to Namche Bazaar. Overnight in Namche at a hotel. We will start early in the morning from Namche. Ascending down the trail, we will reach Lukla. Tapping on the mountainside pathways, we will walk across the Rhododendron and Pine forests until we reach our destination of the day- Lukla. We walk along Phakding, Ghats Khola, Chaurikharka, Chheplung and arrive in Lukla. Overnight at a Guesthouse in Lukla. A short early morning flight from Lukla to Kathmandu is joyful. You will have a day to rest in a Hotel in Kathmandu. In the evening, our team of Himalayan Joy Adventure will host you a farewell dinner at a Nepalese restaurant. It’s time to pack up your bags again. With happy memories of the Everest View Trek, you will fly back to your place. You will leave from the Tribhuvan International airport. What more can I say – Cholendra was amazing. Always in great spirits, organized, and never a complaint. Hiked up to Tengbouche (as well as up the side of a mountain there to get above the clouds and get a clear sunrise picture of Everest) and he even went so far as to track down the one gentleman in a nearby village who had the keys to the monastery that contained the ‘Yeti skull’. Can’t wait to return to go far deeper into the mountains…hopefully May 2010. Keep your calendar open CB, I may be in contact soon!